This product is exemplary for many reasons. First off, after the first time using it to make pancakes, I realized I could never go back to my old method of pouring the batter onto the griddle, which was just using a 1/4 measuring cup. Secondly, cleanup is no harder than cleaning something like a baby bottle; you just have to make sure the spout gets a really good cleaning to avoid any residue buildup, so I would recommend cleaning it right after using it rather than letting it soak. Thirdly, it is now so quick and easy to dispense batter cleanly, whether it be onto a griddle or into cupcake liners or a frying pan or what have you. When I told my mom that I wanted to buy a batter dispenser, she immediately said it'll just be another kitchen gadget that takes up space and never gets used. Mom, you can keep your archaic methods of making pancakes and cupcakes with drops of batter accidentally going everywhere and inconsistent quantities; I'll forever use my batter dispenser. Grab your Discounted Pancake And Cupcake Mix Dispenser while the store LAUNCH DISCOUNT is on. Once we reach 200 unit sales, we will be increasing the price back up to $40.99. Don't you just hate cleaning the drizzled cupcake batter off your cupcake pans before baking? Cut down the mess with this Pancake And Cupcake Mix Dispenser - perfect for cupcakes, pancakes and more! This is brand new Pancake And Cupcake Mix Dispenser you can now dispense the perfect amount of batter every single time with a quick-release handle for instant shut off when you pour. 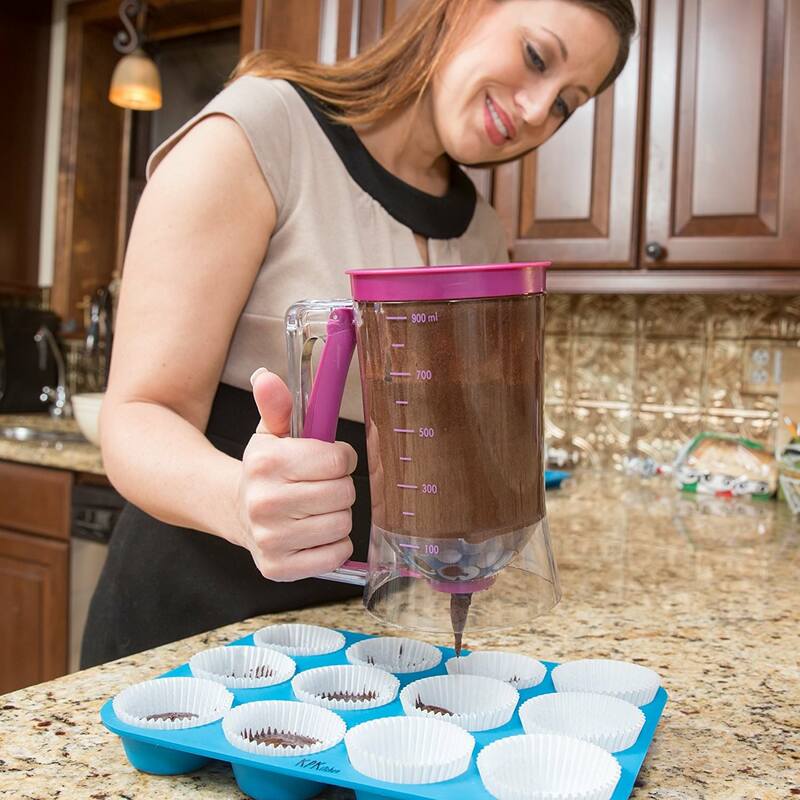 You’ll feel confident, neat and tidy and best of all, you won’t feel like you’re wasting a huge portion of your precious pancake, waffle or cupcake mix! 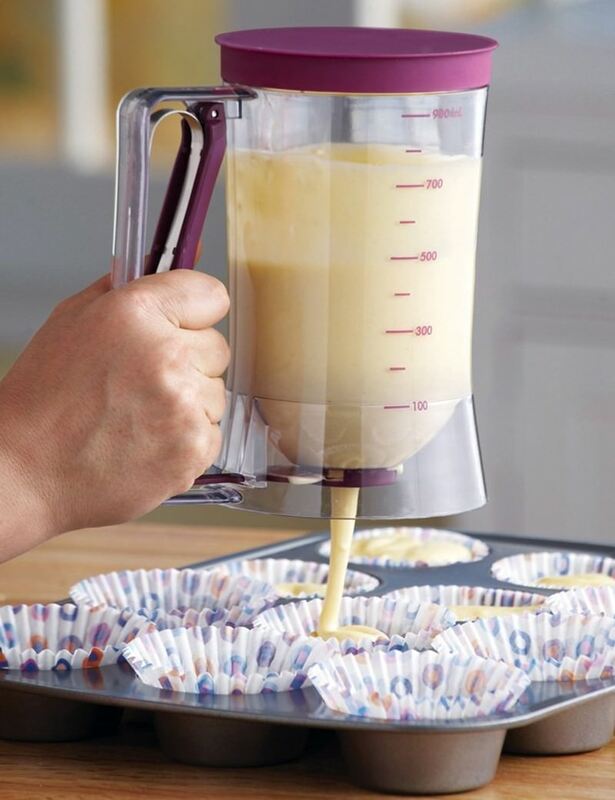 Made from non-stick plastic designed for ease in baking and cleaning, meaning an effortless clean up and consistency that defines a new meaning to perfection every time.The Pancake And Cupcake Mix Dispenser will dispense the perfect amount of batter, you just position and pull the handle for quick and easy dispensing. Great for cupcakes, muffins, pancakes, waffles and more! Nobody likes to clean up batter, and with the Pancake And Cupcake Mix Dispenser you won't have to! Simply pour in your batter of choice and you're well on your way to creating perfectly portioned baked goods & desserts in no time. ✔ BATTER UP! - Pancake And Cupcake Mix Dispenser proudly presents to you our durable and reliable Pancake Batter Dispenser! Made entirely of high quality bpa free plastic, this easy to use baking tool is designed with a wide mouth opening making filling it up a breeze, and the quick close valve makes pouring the perfect pancake like a pro seem like child's play! Best of all, it's ½ inch wide, allowing for chunky muffin mix and small chocolate chips to slide through easy breezy. 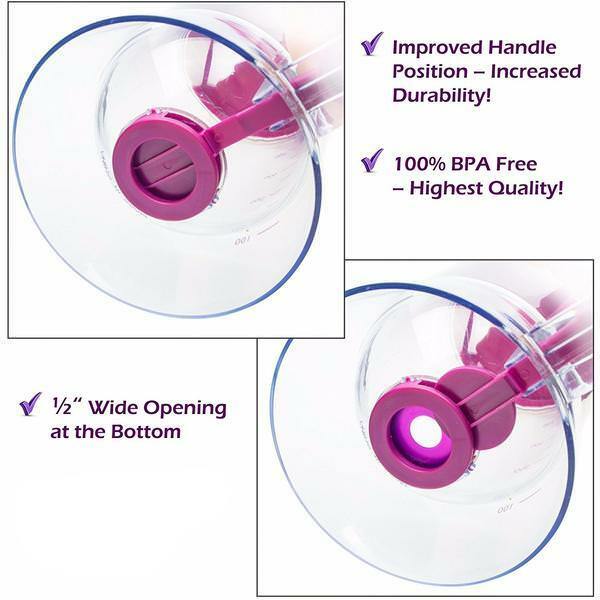 ✔ SQUEEZE ME - Our redesigned pulley handle has been repositioned to ensure quality and durability. In short, IT WON'T BREAK! So squeeze away, pancake after pancake. Not to mention, our fail safe valve doesn't leak, leaving your hands and kitchen clean, and making it safe to use by your little kids. ✔ PORTION CONTROLLED - Lopsided pancake stacks.... The struggle is real. Keeping a consistent size for your pancakes and other baked goods can be a hassle to the untrained eye, but now, just squeeze and go with our food dispenser. Just easy-pull the trigger handle, count to two, and move on. It's as simple as that! ✔ DISPENSING USEFULNESS - Waffles, muffins, cake/brownie mix and even pizza sauce: all fit perfectly through our dispensing valve, offering you the versatility to use your imagination and be in control of your bakery mixes on your pancake griddle, waffle iron and in your mixing bowl. If the batter is too thick, just add a bit of extra liquid and it will work perfectly. This pancake maker also supplies an easy grips system. Who knew that a cooking utensil so simple would end up being so useful? to make sure you get your brand new order ASAP!